Here is a clip of me hitting a winner while pulling back and to the side. First is in regular speed and 2nd is in slow motion. This clearly shows what Oscar Wegner is talking about when he says that you can get good racket head speed while pulling back. No Oscar is just one of many different coaches used here. You should focus on the point of the thread not the name of the instructor. The only instructor quoted more is Coach Suresh. Ya but sureshs is very knowledgable when it comes to tennis. Let's say you are at the baseline and not rushed and have time to set up. What is the advantage of not transferring the weight to the front foot? As I recall at a John Yandell one handed backhand clinic, he said it was very important to get in a neutral stance and transfer the weight from the back to the front. Similarly, I think the weight transfer would apply to the forehand as well. Did John mention anything about your forehand weight shift in his analysis of your forehand? Sick FH, TLM. I would love to see a side video of your FH, because it looks to me like your contact point is not far enough in front. That's a great question, as most teaching pros will mindlessly repeat the same thing. "Transfer weight to front foot." Is that what Nadal and Fed do? Or are they more interested in rotating their core and getting their hitting shoulder out front? This was also standard golf instruction for eons. "Start the swing by shifting weight onto the front foot and post on it." Then some perceptive instructors began to notice that people were hitting some big drives while moving their front foot all over the place, like Bubba Watson and Jamie Sadlowski. You can't have your weight on your front foot and slide it around at the same time, obviously. They had been spared formal instruction and worked it out on their own. It seems that being able to rotate your hips rapidly is what is key, not transferring weight. I will posit the same principle applies to hitting FHs. It seems that being able to rotate your hips rapidly is what is key, not transferring weight. I will posit the same principle applies to hitting FHs. I haven't yet tried what TLM is doing. I get into a neutral or semi-open stance, transfer my weight to the front foot, while also get plenty of core rotation. On the follow through, my chest is facing the side fence. Even more rotation than TLM. Don't see the advantage of this back foot move. Actually, now that I have watched in slow motion, TLM does not not seem to be incorporating much core rotation. Great forehand but it's mainly arm. I haven't closely studied what they do. I just checked some Federer slow mo clips and Fed does the same as I do. Transfer the weight to the front foot. I think part of the pulling back is due to the extreme grip that you hold. You see Gulbis doing the same thing, where he almost leans back on the shot because he's trying to keep the racket face from being too closed at contact. I agree this is part of what creates "his look". He comes to the ball in such a "steep" manner, as his intent is to play as much topspin as possible. I don't have proof, but I don't really think this is ideal form. I'd rather see a player have a straight or balanced spine position at contact and in the follow thru. I'm also not a fan of the western grip; I'd rather see SW. But there's no question that a some players hit extremely well with a Western grip, so who knows? I do hit out in front sometimes but like this forehand I caught it a little late, but that actually helped with the sharp angle. Also that is one of the reasons for hitting while pulling back, you get jammed or you need to make more space. Or you just don't have time to step in so with this pulling back method you can still hit a good shot. I mean look, the guy is a decent club player, and I like his enthusiasm and tenacity. But no, there are so many flaws in this stroke. But again, he gets it done. I have found that I can get good racket head speed by pulling back. There is definitely a time to step back and pull back to generate racket head speed, but I'd suggest your forehand is a one-dimension shot. You have trouble flattening out the ball. I think you could hit flatter if you'd switch more toward a SW grip and flattened out the racket path - at least some of the time. You mean like these forehands? More like the second one. The first still had a lot of topspin on it. Worked well in that situation. Can you hit a really flat ball? I can easily hit a very flat ball, which isn't always a good thing. It is an easy way to generate pace, but it is also easy to hit long. Your aggressive low to high swing path seems really grooved. Even your harder hit balls are heavy topspin. Might be good just to play with different swing paths in practice. Sure, you can be moving backwards and hit a good shot. The question is not what can be done, the question is what is the best thing to do on average. I once hit a volley winner where the ball hit the throat of my racquet. That shows you what can be done, but it doesn't tell us anything about how to maximize my changes of hitting a good ball. 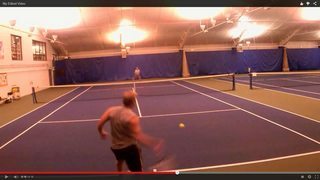 Sorry but trying to compare hitting a volley off the frame to the nice forehand winner I hit in the video would be considered weak at best, not a good comparison in any way. I never said to use not stepping into the ball as a strategy, I step into shots many times. But when rushed in match conditions there are a lot of times you can't step into the shot so it is nice to be able to hit while pulling back also. Both shots had a lot of topspin on them I think the 2nd just as much as the first one. You can hit flatter trajectory and still use a lot of spin. I have never had much luck with hitting flat shots without much spin. You mentioned that you can hit a flat shot easily with a lot of pace and many players want to hit that way. If you can keep them in with that flat fast paced shot it is effective and the ball skids through the court quickly, but for me that is a low % shot way to many errors. It can be done and some guys are pretty good at it but for me I want the ball to dip down quickly. The spin on that first forehand is what made it effective, that is what enabled me to hit such a sharp angle. That would be a very tough shot to hit that same angle and speed without a lot of spin. I will transfer weight into the shot when I have time and set up correctly. But if I catch the ball a little late and need more space I will use the pulling back method to still hit a good shot. Plus it enables me to get a lot of racket head speed and control my shot. I also think that is much more critical to transfer weight into the backhand as opposed to the forehand. Sometime when using a lot of racket head speed and stepping into the shot if I miss time it a little the shot will go long, but with the pulling back method that rarely happens. John Yandell advised me to use more shoulder turn on my preparation. He wanted me to use more turn and hit through the ball more. Heh. I don't think you are winning friends and influencing people with this thread. Where you see 'winner' the rest of us see a returner that wasn't really trying. But I won't say you are wrong..Your kinda right. #1. Stepping back is not a power source - but rotational power is. You can combine stepping the 'wrong way' with a pivot around your outside foot and hit the ball very hard. 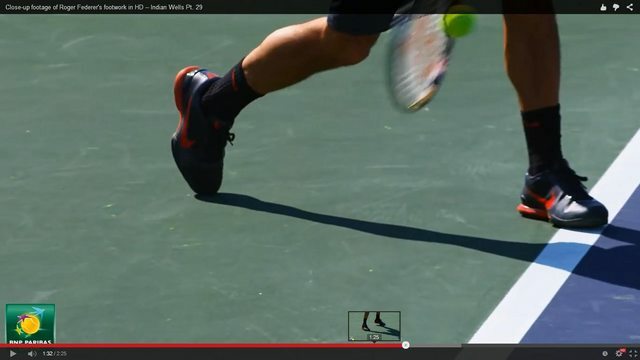 Here is a winner where he seems to get his footwork wrong and the outside foot is actually leading.. But look at that body rotation and use of ground forces..sick. #2. You can rotate off your front foot too - but that step forward is not really about power..
On volley's that where you see linear momentum as a big power source..
1. In that slow motion clip, the incoming ball was very fast (although it was essentially hit right back at you). Did you feel rushed? Would that be an an example of catching the ball late and deciding to go with the pulling off method? 2. On that particular shot, do you feel that you were incorporating sufficient torso rotation? I often hear that we should let the larger core muscles primarily do the work and the "arm is there along for the ride". On that shot, it looks like the arm is doing most of the work rather than core rotation? I caught my buddy off guard so yes he could have made a play on that shot but I would bet at best it would have been a weak floater. Are you saying that this forehand was not a good effective shot? I think that stepping back with rotation and lifting is a power source. As I clearly demonstrate in this video. You can show examples of pro players that are light years ahead of most rec players and use much better advanced technique. But I am showing myself a hack rec player that can get some power on my shot even though I am pulling back. I would say that my reaction and prep was a little late so yes this would be an example of catching the ball late. I am sure I did not get what most would call sufficient rotation, but I did get some rotation combined with some lifting motion. Your probably right I used more arm than torso rotation, which I have a tendency to do anyway and with a shot like this I probably even armed it more than usual. But see the bottom line is I still hit a good solid shot with a sharp inside out angle to it. Even with all the flaws that have been pointed out. So to me considering all the wrong things I did but still made a pretty good shot is a good thing. Well they may have been lame but I won the point on both of them. The guy asked me if I could hit a flatter shot so I showed him a couple. Look I am just a weak hacker compared to all the elite players here. I am just showing that even a hacker with lame shots can win some point once in a while. Obviously it was effective against this opponent. My feeling is just that even when you are correct you get blow back..because well frankly you sound full of yourself. You are stepping back and then using rotational power IMHO.. You wouldn't claim that a guy can't step back and crush an overhead. But its not the step back that makes the overhead effective. This is what Julian (I think) was saying in the other thread. The reason why guys can hit monsters shots off their back foot isn't because they are stepping back. It's that rotational power is the big power source nowadays - along with ground forces (aka jumping while spinning).. The first one had topspin but the only reason it had some dip in it is because the pace was slow. I'd say that overall the rpms weren't high. Tlm, was way inside the baseline with a lot of time and his ball landed inside the service line and had no penetration because it almost it wasn't rising as it crossed the baseline. It almost hit the baseline on the 2nd bounce. A ball hit from that position in the court absolutely has to go through the court. I think the shot looked better than it was because his partner hasn't learned how to move yet. The opponent should have run to cut the angle by running towards the ball. Instead he runs parallel to the baseline and was actually heading back away from the baseline which made him take a longer time to reach the ball. I've noticed his opponent always does this.. but he'll learn. That ball should have been hit for a winner or at least penetrate the court. And on the 2nd point the opponent is out of position when tlm hits it. He should have been 2 more steps over to his right. Or at least 1 full step over. That ball also should have been put away. I mean... that's the point of all this topspin isn't it?... stay in the rally until you get an opportunity... then put it away or hit a good shot.. not brush another topspin ball with more topspin giving the opponent time. C'mon tlm!! You hit good shots. no doubt. You're very consistent. Okay but that shot would have been effective against most anyone that I play. Evidently you play against a much higher level of players than I do. Which would seem like that would make you the one that is full of yourself. Making a comparison between stepping back on an overhead compared to a forehand makes no sense in any way. Really the main blow back seems to only be coming from you and cheetah. But hey obviously you and him are much higher level players than I am so that's fine. A simple question tlm: What muscles are getting sore when you play? Arm? Shoulder? Abs? Glutes? You usually make some good points and seem to know a lot about tennis. But when you claim that the only reason those shots had dip to them was because of lack of pace and not spin shows you have no idea of what you are talking about and you are completely wrong about that. Both of those forehands had a lot of topspin on them, actually like wild volley was suggesting I should have hit them with less spin and they would have been more of a penetrating shot. But for you to say that they did not have much spin on them is laughable at best. You did mention at the end that I should have hit them through the court more and used less spin and now that is a valid point. Really I only get a little sore in my gluteus and legs, not much in the upper body. So I think you should learn how to use more explosive power from core rotation muscles. My rotation working abs get always sore after playing. Since you've done gym workout, I think it's relatively easy for you to feel which muscles you use in different motions. So next time on court, try to activate rotational abs in your swing, without thinking anything else. Just think what you should do so that you kinda "throw the racquet to the ball with the abs". After you find the feel for that, then try "throwing the racquet with glutes". Think what you should do to load the glutes, before you explode from them. IMO that's what's lacking in your swing, a REAL activation of glutes and abs. Do NOT think about the technical details of the swing, just think about the muscle activation for a while. I'm the pull-out king! I"m the pull-out king! Oscar's the pull-back king! Oscar's the pull-back king! There is no doubt that I should use more rotation and kinetic chain to get power from. I am working on that trying to not use the arm as much, but it is a work in progress. I am hoping that one day I will get the feel of it and something clicks and I will not have to arm the ball so much. But couldn't you at least shadow swing that way. Shouldn't be too hard without the ball? Show us that you're REALLY willing to improve, and not just bragging about some winners against lame opponents! I like some of what I have heard from a lot of different tennis instructors. I do not agree with everything Oscar says. But this is an example of hitting while pulling back. So if a player at my low level can hit a good shot from that position then obviously a pro can hit a very good shot even when pulling back. 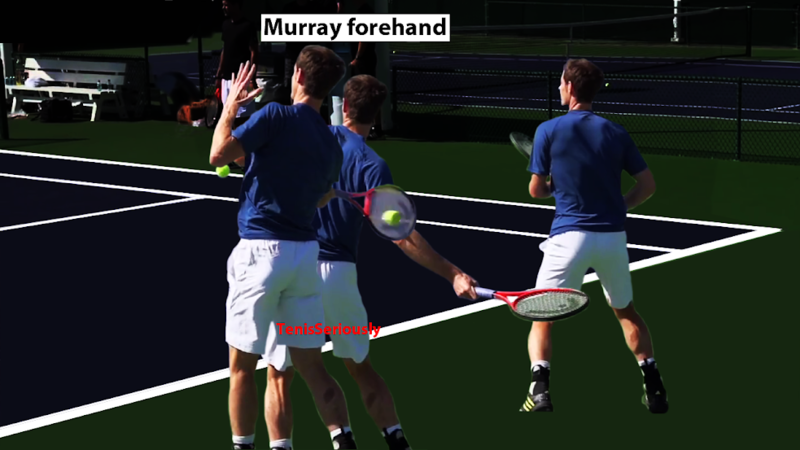 If you watch a lot of slow motion forehands of pro players this is very common. But I do realize that many have this you have to step into the shot to get any power so driven into their brain that it kills them to see the obvious. What level do you play at? Because at my low level these are not lame opponents. I have tried shadow swinging and I can do about anything I want then. But it is a lot different when on the court hitting a moving ball. By the way do you have some video of you hitting so you can demonstrate how it is done? And better yet against some non lame opponents. I once thought that Cheetah was dead wrong about the bh. He said that one could get plenty of top with an eastern grip and that I should ditch my Sw bh grip, etc. turns out that he was 100% right. I couldn't see it because I was arming the ball at the time and had no idea how to hit loose. Now that I am hitting loose and not arming I can see what he was saying. Also I am not sure oscar is talking about leaning back. Watching the vid I don't see it but on the bh he does mention it. Where is 5623 when you need him? I am not saying that this is the best technique to use. I will step in more when I have time and am set up early. But that does not always happen and I am just showing that you can hit a pretty good shot even when pulling back and not being able to step into the shot. This is Murray difficult forehand. He runs backward along the baseline. His body, around contact, is slightly falling back, but right shoulder moves forward. A right hander will push his left side back to give a forward impetus to his right/hitting side. I think everyone does it occasionally, without even thinking about it, as the need arises.